Next morning we went further. 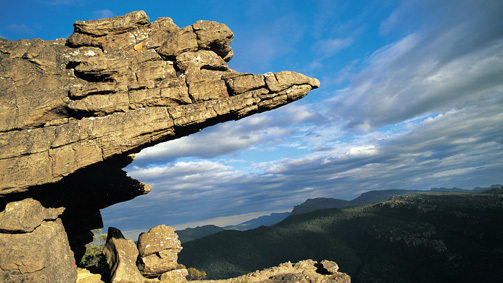 Our goal was to hike at The Grampians National Park, but, as you will see, the weather changed our plans. The Park was listed on the Australian National Heritage List for its outstanding natural beauty and being one of the richest indigenous rock art sites in south-eastern Australia. The best time to visit is winter or spring, as it might be very hot in summer there. According to our book about National Parks of Victoria, this park is famous for its variety of walks, from a leisurely waterfall stroll to a challenging hike revealing grand views from mountain peaks. The most famous are The Grand Canyon, Pinnacle Walk и The Balconies Walk. We decided to try a very easy 3kms trail. I do not remember it's name, as this was long time ago. We saw a small waterfall, had a rest and decided to go further. The good thing that I really liked is that there were a lot of yellow markers, informing you where you should go. At the end of our walk we were lucky enoght to make some good photos of the Lake Bellfield. Rain had started and we were wet when we came back to our car. We spotted kangaroos, had a lunch and headed to our next stop at Portland.